With winter drawing in (eep, sorry!) and the sun going down earlier, I’m starting to rely on makeup to give my skin that healthy summer glow. I know a lot of people prefer mattes and toned down makeup for autumn and winter, but for me I find that slight shimmer really brightens up my face and makes me look a lot younger. Which is something I should start thinking about more consciously, as I still think I’m 16 at heart! 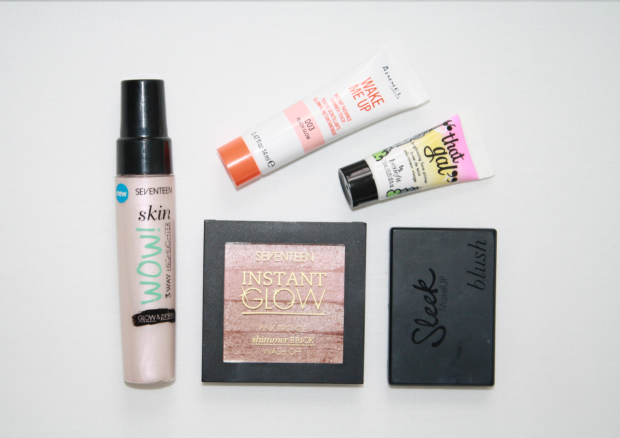 These are the products I’ve been turning to when looking for that glowing complexion. Unlike most primers, That Gal doesn’t have a silicone feel, it’s actually more of a slimy moisturiser! It blends in well though and loses any slime feeling, although I find it’s best to wait a few minutes before applying foundation. The formula is pink with a soft shimmer running through it, and this somehow transforms the dullest complexion into a smooth, glowing one. It really brightens up any dark or dull patches, and evens out your complexion so even dark eye circles are minimised. I never really got highlighters until about a year ago, and now they are my go to for brightening up my face. A little highlighter on my forehead, nose and cheekbones mimics the light hitting these areas and brightens up the overall look. The Seventeen Wow! Highlighter is super blendable and you only need the tiniest bit for it to work. I look a lot younger when I’m wearing it, and I’ve been complimented on how bright my eyes look more than once with it on! I’m not one for traditional pink blushes, I have naturally quite red and chubby cheeks so the last thing I want to do is give myself more colour on top of that. 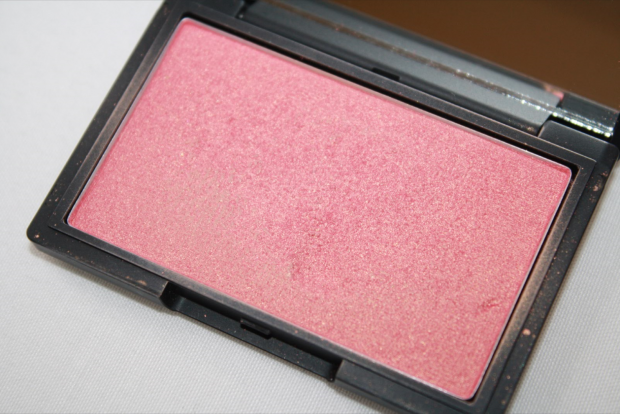 Rose Gold is a pink blush with gold flecks in it, and it translates as the most beautiful champagne pink when applied. The gold flecks mean that there is a very subtle shimmer, and applied across the top of the cheekbones this blush just gives the most beautiful glow. I think this is such a beautiful little product, the colours are gorgeous individually and there is a gorgeous soft shimmer running through them. Whilst the colours aren’t very pigmented, it’s easy to build layers and the combinations of pinks, browns and shimmer gives a glowing, sunkissed look. See my original review here. Whilst I love the brightening effect white highlighters have, some days I want something a bit more subtle and that’s where this Rimmel Shimmer Touch comes in. The formula is a soft peach with shimmer running through, and it almost melts into your skin and blends like a dream. The peach tones are such a good match for my skin that I’m left with an extremely subtle glow that is barely noticeable, yet somehow really perks up my complexion. You can read my original review here. If I had to pick my favourite out of these, it would probably be the Rimmel Wake Me Up Shimmer Touch and Seventeen Shimmer Brick, they make a beautiful combination! I don’t think you could go wrong with any of the products though. Aside from the Benefit Bad Gal Primer, you can grab any of these for under a tenner too which let’s face it, is ideal for those skint winter months! What do you use to fake a healthy glow? A £16 Heal Gel Dupe? !